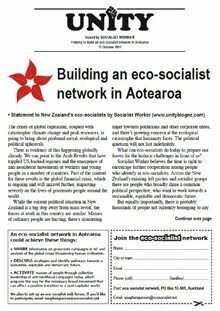 Following the success of the Eco-Socialism Aotearoa Facebook group, which we set up in 2009, Socialist Worker has initiated an Eco-Socialist Network. As a first step we are collecting names and email addresses. 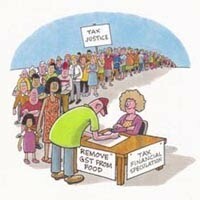 The next step will be establishing a website and on-line forum for networking and discussion. The 'Left Unity in Aotearoa' meeting, which was part of Socialist Worker's national conference in April, agreed to support the call made by Sue Bradford on her Facebook page for NZ activists to attend the Climate Change/Social Change conference in Melbourne (30 Sept - 3 October). 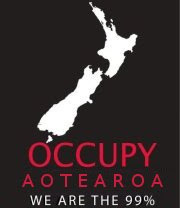 And that activists in this country should look to cooperate around organising a New Zealand 'Climate Change/Social Change' conference in early 2012. David Colyer was nominated by the meeting to liaise with other eco-leftists about organising a 'Climate Change/Social Change' conference on this side of the Tasman.